Mineraluxe will help you fall in love with your hot tub all over again. Tired of complicated potions, soaking in chemical soup and feeling like you need a degree in chemistry just to own a hot tub? There’s just no easier way to care for your hot tub. Once a week, you just toss a cube into your skimmer, add a pouch to your water, then add bromine or chlorine. Mineraluxe will make you fall in love with your hot tub all over again. After all, you bought your hot tub to unwind at the end of the day, to enjoy a romantic escape with the one you love and for a fun place to catch up with friends! Come in and try Mineraluxe for yourself. Discover more about our Exclusive Free Offer below! Click here for our EXCLUSIVE OFFER! Ease of Use – With just 2 products added once a week, the system fits well with hot tub owners looking to reduce the overall complexity of maintaining their hot tubs. The only additional step is to maintain an effective sanitizer residual and to continue to maintain pH in an acceptable range, both of which should be standard practice with any hot tub system. 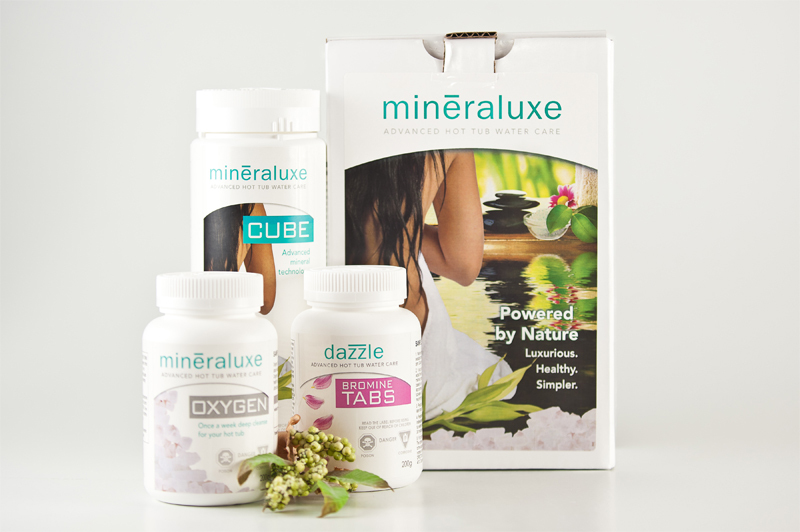 Performance – Focused on prevention, the unique fusion of the all-natural mineral technologies in the Mineraluxe Cube will control and remove scale and biofilm better than any other system. In addition, it will provide water that has unmatched clarity and comfort. Comfort – The unique mineral composition of Mineraluxe provides a bathing experience that can best be described as luxurious. Users describe it as a velvet glove being wrapped around the body. The key to the exceptional comfort is the built-in moisturizers in the system. Mineraluxe has been found to significantly reduce or eliminate the harsh, dry effects of soaking in a hot tub. The result is a mineral bath of unparalleled comfort. More details on switching to Mineraluxe can be found here. Our hot tub water used to look dirty no matter how much we tried to maintain it….as soon as we changed to Mineraluxe, our water has stayed crystal clean. ..Mineraluxe has been amazing for us and we recommend it to anyone who has a hot tub.